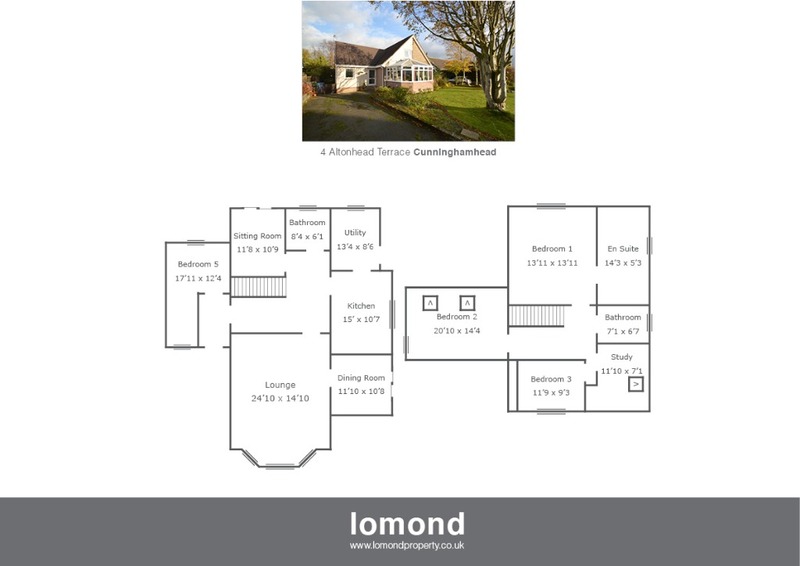 4 Altonhead Terrace is a substantial detached villa situated in the popular Hamlet of Cunninghamhead. The property boasts 8 principal apartments with generous garden grounds and off street parking. In summary the property layout extends to an entrance cloakroom leading to the reception hallway, and main ground floor living space. The front facing lounge has been extended (conservatory) to create a wonderful area for all the family to enjoy. Off the main living area the dining room is accessed via French doors. The dining room in turn, allows access to the rear garden via patio doors and the stylish kitchen. The kitchen is well appointed with a centre island preparation area (with storage), and a number of floor and wall mounted units. To the rear, off the kitchen, the utility room has sink, and separate storage cupboard housing the recently fitted boiler. The remainder of the ground floor comprises a shower room, and two bedrooms, one of which is utilised as a TV room by the current owners. The upper level is accessed via the staircase off the main hallway, and houses three further bedrooms, a study and a second family bathroom. The master bedroom benefits further from an en suite bathroom, with bath, WC and WHB. The family bathroom is well presented with bath, WC, and WHB, all finished with stylish modern tiling. The property benefits from LPG central heating and double glazing throughout. Externally the property has grounds to the front, side and rear. To the front the garden is laid to lawn with mature shrubs, and dual driveway. To the rear the garden is large, laid to lawn with patio area and mature shrubs. Altonhead Terrace is an established residential location. Both Kilmarnock and Irvine towns provides access to a range of amenities including supermarkets, bars, restaurants and town centre shopping. There are a number of local primary and secondary schools within the greater Irvine/Kilmarnock/Stewarton area. The property location is within close proximity to the A77/M77 providing excellent links to Glasgow and beyond.